Scolymia corals have been quite the crowd favorite among the high end LPS enthusiasts for quite some time, but they are typically only encountered as single polyp corals, albeit vividly colored single polyp corals. Occasionally, we do get to see an individual that’s starting to or just recently split into two distinct mouths. Heck, we’ve even seen two completely different colored individuals on the same rock, but never before have we seen a “Scoly” with four mouths! 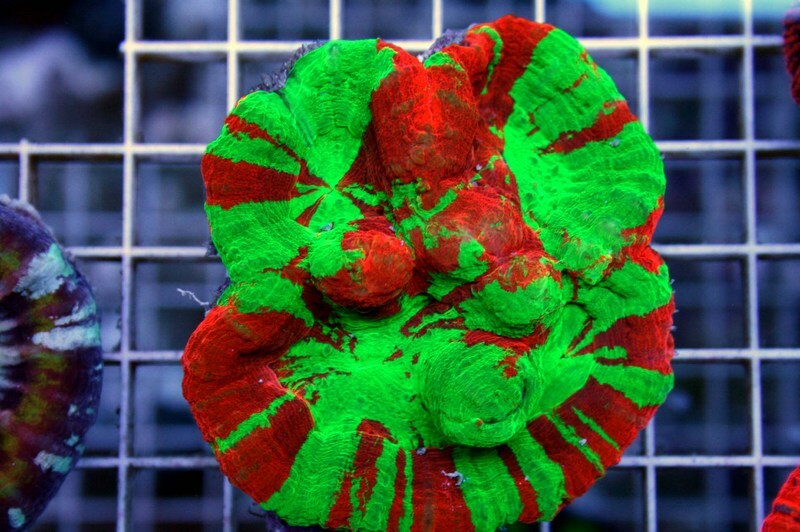 This amazing coral, which comes to us from the guys at Route 66 Marine and one that we have dubbed the “QuadraScoly”, is of the bleeding apple variety and has at least three separate heads. The largest head is slowly diving to make the fourth, though it hasn’t quite made the transformation yet. It would obviously take a while for the four heads to wall off from each other completely, but this process could be sped up with a little fragging, though we certainly don’t suggest it on a piece as rare and amazing as this. Thats funny because I bought that coral from R66 marine. Like to see the pics?